We understand there may be situations where you no longer wish to have a domain name registered to you. If you decide to cancel (delete) a domain from your account, you can do so at any time. Warning: When you cancel a domain name, it is immediately deleted from your account. The cancellation cannot be undone. You may wish to Turn off auto renew instead. 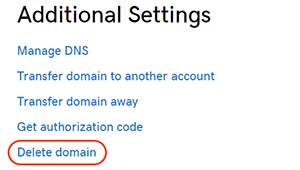 From the Domain Manager, select your domain name to go to the Domain Settings page. Check if your domain has Protected Registration enabled. If so, it MUST be removed first. Make sure the domain is in an active status (i.e., not expired or pending a contact update). Scroll down to the Additional Settings section. Click the Delete Domain link. Select Yes, I want to delete this domain and make it available for someone else to register. Click Delete domain to confirm deletion and cancel your domain name. Note: If the Delete domain link is showing as Disabled, make sure your domain name is in an active status and does not have Protected Registration enabled. The registry may hold your canceled domain name before releasing it for others to use, so you might be able to re-register it once it is released. For refund eligibility, see our Refund policy. Looking for a different domain name? Learn more about Registering domain names.